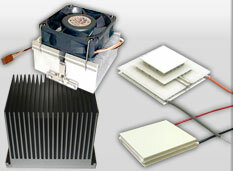 Thermoelectric Modules also known as TEM, TEC and Peltier cooler/devices are available in a wide array of sizes, operating voltage, current and cooling capacity. Produced using Crystal LTD’s high performing thermoelectric elements, our TEM offering are well suited for cooling/heating, thermal cycling, high power density and power generation applications. The product line features miniature, multistage, annular and center hole types with options for continuous operation up to 150°C. Options include high tolerance lapping, epoxy and silicone moisture seal, and wiring in kits/arrays. Thermoelectric Generators Modules and Assemblies are designed for power generation at temperatures up to 570°C. Crystal LTD’s G Series TEG modules and H series cooling modules offer high efficiency in power generation applications at temperatures up to 150°C. Options include wiring in kits or production of customized assemblies. A wide variety of standard thermoelectric assemblies (TEA) are available through the Adcol product line. The standard offing includes TEA types: Air to Air in sizes from 15 to 200 watts, Air to Plate in sizes from 42 to 80 watts and Liquid to Air in sizes from 50 to 300 watts. We offer rapid prototyping for custom designs and a strong supply chain for high quality components at extremely competitive prices. Located in Guangzhou, China we have strong ties to the world’s leading manufacturers of thermal management components. Align Sourcing/Adcol USA provides day to day support to customers in the Americas. Align Sourcing provides end to end logistical support from order placement to delivery for convenience and lowest landed cost. We support managed inventory programs and maintain inventory of standard products to minimize lead-time. Our TIM offering is designed for compatibility with Thermoelectric Modules (TEM), Thermoelectric Assemblies (TEA) and Heat Sinks. TIMs are designed to improve heat transfer by filling gaps with thermally conductive materials reducing thermal resistance and improving thermal performance. TIM materials are available in the form of thermal grease/compounds, Epoxy and thermally conductive graphite foils. We have custom formulating capabilities and production in the USA and China through EMS. Complementary products used on Thermoelectric Assemblies and in other thermal management applications.